White Screened, Now It Won't Boot. Help? So lately I have been having some pretty bad slowing issues with my computer. When you go into the task manager the disk usage was usually 90% or higher. I ran an avast clean, malwarebytes, and CCleaner. I went through and uninstalled a lot of the things I don't use. Things seemed to be running a lot smoother until last night. Last night I had the message repeatedly come on saying that my trial with malwarebytes was ending in 1 day. I clicked it to close but than it would just pop right up again. I got annoyed and just ended up uninstalling the program. Well later that night, I was playing Final Fantasy with a friend when my screen flicked grey and the picture was cutting out for a couple of seconds. Suddenly my entire screen went white and white noise/screeching of death came out of my headphones. I kind of sat there for maybe a solid minute in shock because this has never happened before. I hard shut down my computer and went to turn it on. Power is going through it, all my fans were working, the lights that were supposed to be on my MB were on, my mouse lit up, and the light on my microphone was on. But my keyboard and monitors would not turn on or come off of sleep mode. It wasn't connecting at all. I turned it back off and on after letting it rest for awhile, still nothing. Tried again this morning, still nothing. I am really hoping my MB didn't fry because its only 2 years old. Actually, everything in that tower is about 2 years old. The only thing that isn't, is my graphics card which is closer to 4 years old. I'm scared to buy a new piece of hardware and it turning out to not be the root cause as I am not in a great place financially to purchase a new MB or graphics card that will fit my gaming needs. Could this have been possibly caused by malwarebytes or was this a big coincidence? Any thoughts? You are posting a reply to: White Screened, Now It Won't Boot. Help? 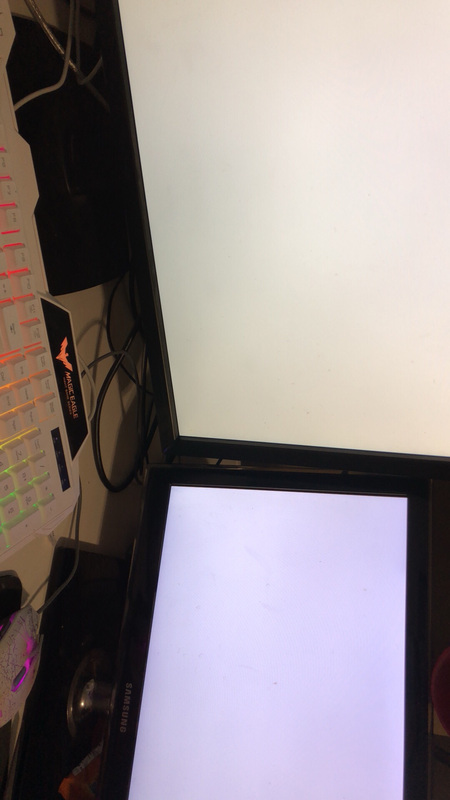 You are reporting the following post: White Screened, Now It Won't Boot. Help? Does the BIOS screen show? In reply to: White Screened, Now It Won't Boot. Help? That doesn't require any OS to load and not caused by Malwarebytes or other. There's little to work with here. You write about a graphics card but omit it's make, model, age along with other PC details. VGA can be a white screen when unplugged but no mention of connection. Tell more so folk can make a few guesses. In reply to: Does the BIOS screen show? More information might be helpful! Sorry about that. Nothing comes up on the monitors. They stay in sleep mode when the computer is turned on. Need a tiny bit more. But I can't tell which i7 you have, Why it matters. https://us.msi.com/Motherboard/Z97-GAMING-5.html shows HDMI and VGA outputs so it is possible with the right Intel i7 that we can unplug the graphics card to test if that is the cause. This is called "try the onboard graphics" test. The AMD Series is just that. I can't use that to nail if it's some card that folk complain about but when folk tell me "AMD Radeon R9 200 Series" it usually means it's some HP 2222lx box. I can't guess which make and model box from this but it's usually a sign it's a premade box. If you know, go ahead and share since if you don't know the CPU model I might be able to find out.